In 5-quart nonstick Dutch oven, heat evaporated milk, 4 cups hot water, macaroni and salt to taste to boiling over high heat. Reduce heat to medium-high; cook 6 minutes, stirring frequently. Reduce heat; simmer uncovered 8 minutes, stirring frequently; do not drain. Though the flavor of sharp Cheddar can't be beat, 8 oz of processed American cheese makes a creamy, kid-friendly substitute. 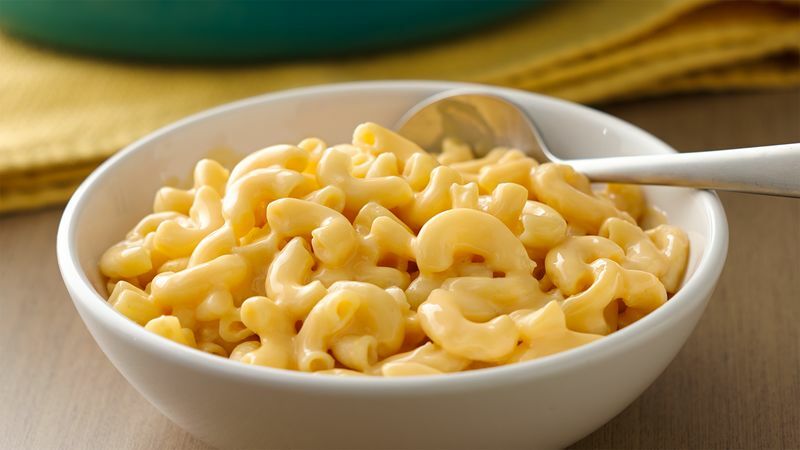 Macaroni and cheese gets its name from the noodle most commonly associated with it: elbow macaroni, of course! But you can substitute other types of pasta for elbow macaroni if you so choose, as long as you keep a few things in mind. When it comes to mac and cheese, you want as much cheese sauce as you can get in every bite. That’s why you’ll want to use pasta noodles that have little nooks and crannies that can catch the cheese sauce—pasta types like rotini, shells, farfalle and orecchiette are all excellent choices! You’ll want to stay away from the skinny, smooth noodles like spaghetti and fettuccine. Once you’ve tried this basic one-pot mac and cheese made with only three ingredients, you should try all of our delicious riffs on this delicious dish! We have every macaroni and cheese recipe you could ever want, from baked mac and cheese and slow-cooker mac and cheese to Alfredo mac and cheese, and more!